It has been 12 years since Barbershop 2: Back In Business disappointingly grossed $11 million less than its 2002 original. So when it was announced that Barbershop 3 would be released over a decade after its predecessor, movie fans were rather surprised. This shock extended to the Barbershop cast and crew, too. But during a set visit to see Barbershop 3 being filmed last year, Cedric The Entertainer revealed to me and a group of visiting press that he had one specific caveat for returning to the comedy: that his character didn’t die. The biggest thing is that Eddie was already old. As long as he don’t die. I told them that off the top, don’t make me die. If I die, then I ain’t coming. While Cedric The Entertainer was the main source of comedy in both Barbershop – he had some support from Anthony Anderson – and Barbershop 2: Back In Business, with Barbershop 3 he has help from bona fide comedians J.B. Smoove, Lamorne Morris, Deon Cole, Scary Movie star Regina Hall as well as the returning Anderson. The above posse are joined by Ice Cube, Eve, Sean Patrick Thomas, Tyga, Common, and Nicki Minaj for the comedy, which is being directed by The Best Man and Soul Men’s Malcolm D. Lee. Barbershop: The Next Cut revolves around the employees and patrons of the Barbershop trying to save it and their south-side Chicago neighborhood from warring gang members. 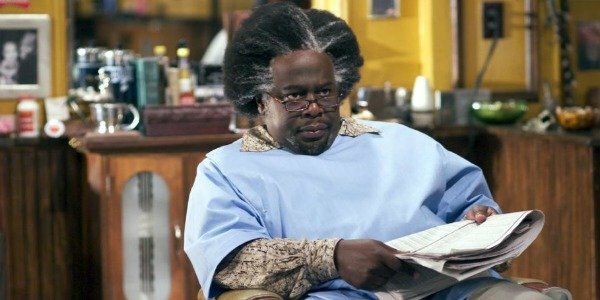 Cedric The Entertainer went on to insist that as well as making sure that Eddie didn’t die, he would only return for another Barbershop movie if it moved along the characters and plot in a funny and interesting manner. Something that, since he signed up, he obviously believes Barbershop: The Next Cut does. I’m one to believe that you just can’t just do sequels, just because they’re doing them. A lot of times, you don’t know the motivation of the studios or whatever, but the movie had to be right. It had to be something, and hopefully we wanted to see it move along. That was the key for me, is to see, where was this story or where were these people 10 years later? You don’t have much longer to wait and see if that’s the case because Barbershop: The Next Cut will be with us in the middle of next week, arriving in cinemas on April 15.